I recently bought a new lens to my Canon EOS digital camera. For you who are into cameras, it's an EF 50mm f/1.8 II lens, which means that it's great for portraits as the images get really sharp and the backgrounds blurred. 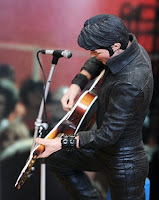 For some reason or other I thought I'd test it on my '68 Comeback Elvis figure made by McFarlane Toys. After a couple of shots I got the idea to include a background as to make it more realistic. 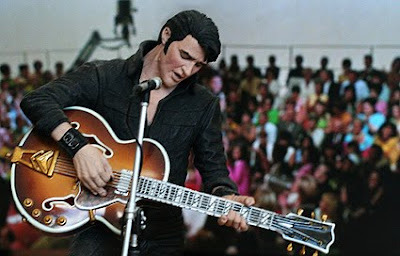 It wasn't easy to find a photograph from the NBC television special I could use, as Elvis always took up a big part of the picture. After a fruitless search in my Elvis books I came to think of the booklet accompanying The Complete '68 Comeback Special 4 CD box set. Turned out the centerfold contained just what I was looking for: a great shot of the studio with a big part of the audience visible and Elvis just occupying a small part of the photograph. I then asked my wife to hold the booklet open behind the figure, which I placed on the floor. Lying down in front of my hastily constructed "NBC studio", I grabbed my camera and took a couple of photos. 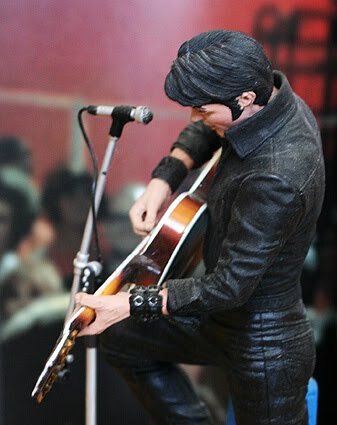 After some creative image editing in Photoshop I was rather pleased with the result, even if the audience is too far away and it's painfully clear that Elvis is in fact a doll. PS: The second photograph included was in fact taken using part of a picture I found later on in a photo book with images of Elvis from the archive at Graceland titled Elvis: A Celebration.